"Take over, Number Two, I'm updating my Facebook status." 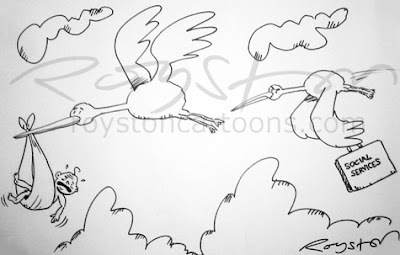 The Shrewsbury Cartoon Festival was held last weekend and was as great a success as ever, despite the presence of rain this year (we've been lucky in the past). Above is a cartoon of mine from the Flights of Fancy exhibition, which can be seen at the Visual Arts Network gallery in the town's Market Hall until the end of the month (the exhibition then goes on to other venues, details here). 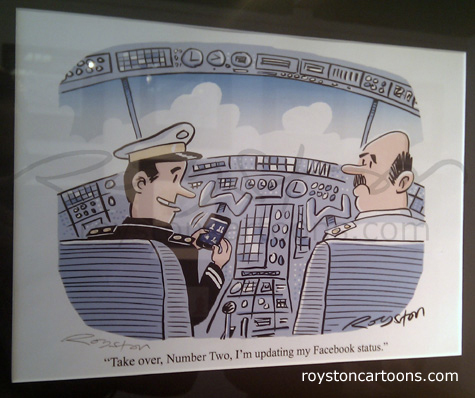 I've got three others in the show, all original drawings (this is a signed print of a cartoon drawn for a PR company a few years ago, on the theme of "social not-working" in the workplace). "Insert funny caption here ..."
This cartoon was used on the Reader's Digest stall at the festival, as one of the drawings for the Beat the Cartoonist caption contest on the Friday. They'd packed up for the day before I made it to the stall, so I've no idea what the public came up with, and the cartoon has not yet been published, so I'm not going to tell you the original caption. I was not an official participating cartoonist this year, so I was able to get around and see more than usual, without having to worry about getting a Big Board painted. So this year I managed to get to the Reader's Digest talk by Steve Way, the cartoon editor, and Martin Colyer, the design director. 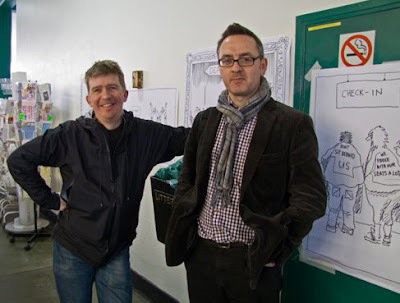 I'll spare you the pics of drunken, singing cartoonists this year, but here's one of Matt Buck and I (thanks to Nicolette Petersen) at the Humurals, where cartoonists do on-the-spot drawings to create an instant exhibition. Here's one I came up with, on the festival theme of Flying. Lots of us involved in the festival, and others, were tweeting about #shrews12 throughout the weekend and posting pictures. 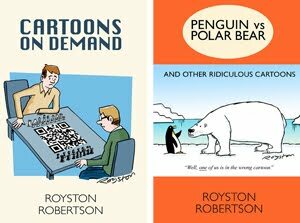 You can see a round-up of lots of that here, and we've put lots more words and pictures at the Procartoonists.org blog. I'm already looking forward to next year's festival which, amazingly, will be the tenth. 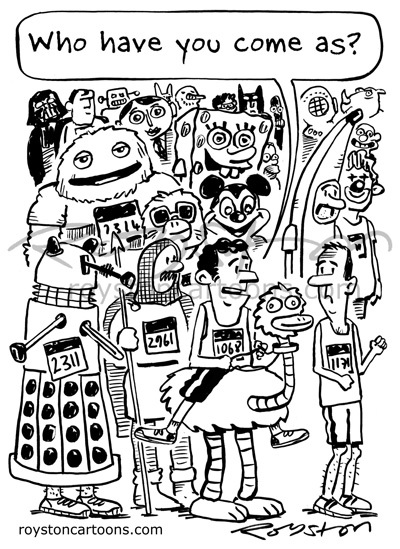 It's the London Marathon this weekend, so I drew this cartoon for a newspaper preview of the event. Sadly I cannot take part, ahem, because as usual it clashes with the Shrewsbury Cartoon Festival. I'm off up to Shrewsbury tomorrow. Expect a blog post on that next week. In the meantime, here's a cartoon drawn for the "Humurals" at last year's festival, which had a sporting theme. 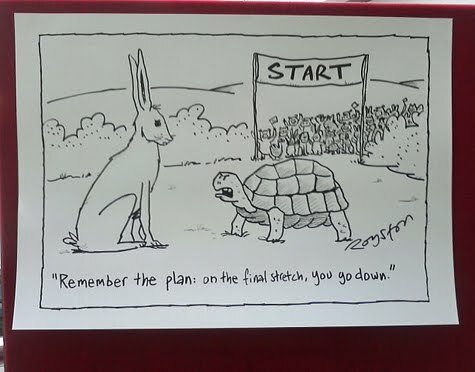 "Remember the plan: on the final stretch, you go down." "Wow! That's probably the best Kyrgyzstani neo-realist horror-comedy crossover I've seen so far this year." 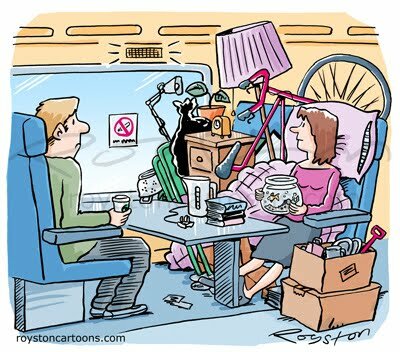 The job of a cartoonist is to poke fun, and that can apply even when the subject is something you actually like. 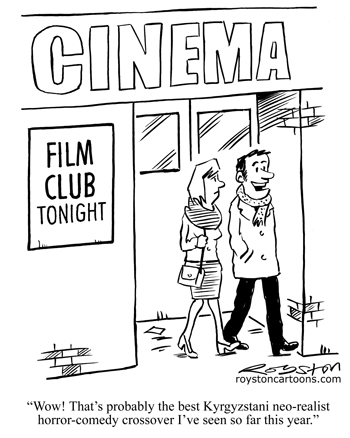 This accompanies an article in Isle magazine about two local film clubs. I'm a fully paid-up member of one, the Thanet Film Society, and regularly attend its screenings at the Palace cinema here in Broadstairs. They actually did show a Kyrgyzstani film recently. It wasn't a horror-comedy crossover though. I'm eternally grateful to them for bringing films that barely get shown anywhere to our corner of Kent, and I hope they'll forgive this spot of piss-taking. Just doin' my job. I've already blogged here about my son's love on drawing, but my 19-year-old nephew is a keen scribbler too. 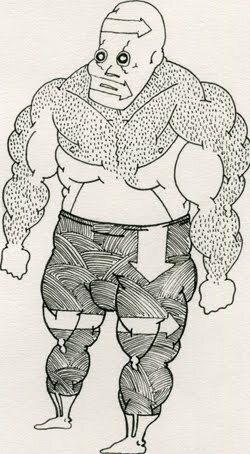 It's pretty crazy stuff, a clear influence being the drawings of Vic Reeves, with a touch of David Shrigley. Take a look. Warning: contains wrestlers. Lots of wrestlers. 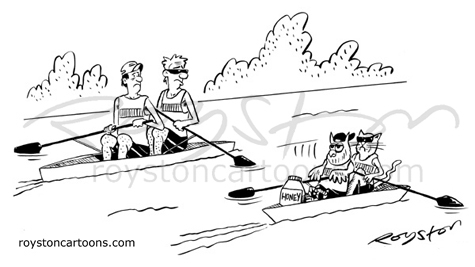 This cartoon, which was in an exhibition at last year's Henley Regatta, is now available as a greetings card. It will be sold in the shop at Henley this year. It costs £2.50, with proceeds going to the Stewards' Charitable Trust, which works with schools across the country, encouraging young people to learn to row. Even Trenton Oldfield can't complain about that. 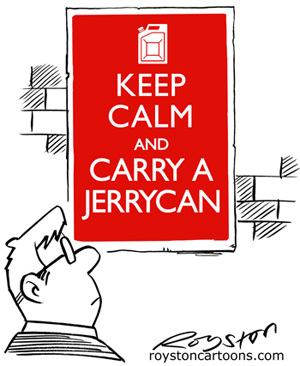 OK, I know "Keep Calm" poster spoofs have been done to death, but it seemed appropriate for this cartoon about the UK's fuel "crisis" (read "panic") which appears in a local Kent newspaper this week. I tried the gag first at Private Eye last week but they passed on it -- probably because they'd planned this Keep Calm cover spoof. You can't keep a good meme down.